As motocross riders we lust after all things expensive, exotic, and on all the factory bikes. Titanium parts have long been in that category and we all think it is the coolest metal out there. But what do we really know about titanium? It is light and factory-level motocross and supercross teams use it liberally throughout their machines, but how does it compare to steel and aluminum? Other than being light, there are a lot of rumors and anecdotal evidence that titanium is brittle, or that it stretches, or behaves strangely, or that it doesn’t last as long as steel. We wanted to get to the bottom of this to really understand how titanium is different than steel and aluminum, and why it is used in some areas but avoided in others. Dirk VanCott, Owner of Mettec Titanium Fasteners, was kind enough to give us some of his time to explain the facts of titanium and why it is really good for some things, yet not so good for others. Dirk started the business in 1995 making fasteners for all kinds of motorsports and commercial applications as well. In 2001, they started to focus more on the motocross industry specifically and working with the Factory Connection Honda team, and branched out from there. Today they are on many of the factory teams and everything they make for the factory guys is available for you to purchase. Starting with a little history lesson, when did titanium start to play a role in the motocross industry? The precursor to it, everyone talks about the factory teams having the advantages. Back in the ‘60s and ‘70s, with the titanium coming out of the aerospace industry, a lot of the factory teams had access and the budget to be able to build titanium fasteners. Back in the ‘70s, going into the early eighties, the machining of titanium was quite tricky. The CNC machines and the quality of the cutting tools to cut the material were still relatively expensive and hard to handle. If you talk to anyone that has been around motocross for a long time like Roger DeCoster, back in the ‘70s he had bikes totally decked out with titanium fasteners with the factory programs. But for privateers it was really hard to get their hands on it. Then CNC machines were more available, but this is where a lot of the bad wrap started with titanium axles and fasteners. CNC machines were coming along and people could take titanium bar and machine it and make a fastener by just purely machining it out of bar stock. The problem with that is if you want to make an aircraft quality fastener, it needs to be hot forged, meaning it needs a forged head to get the proper grain structure, followed by the proper heat treating and then you need to have a rolled thread. 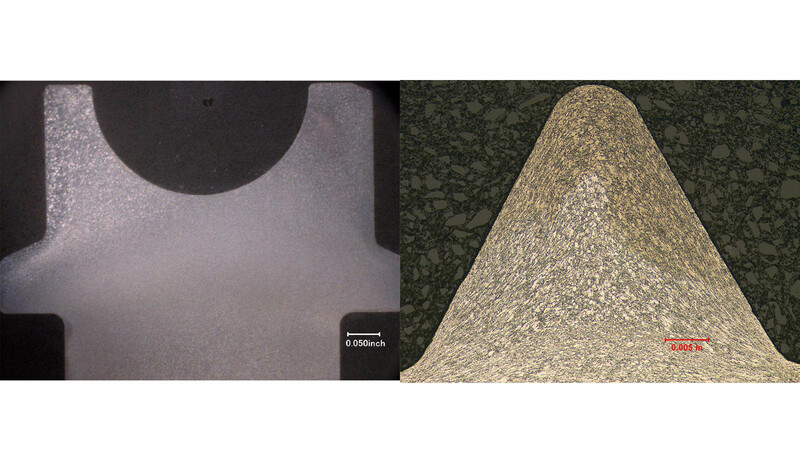 When you put a piece of bar stock into a CNC machine and machine it, you build up stress risers in the surface and they look like little Grand Canyon fishers on the microscopic level and then they would get fatigue cracks under the head or they get fatigue cracks in the threads and the bolts would break. Titanium seems to be more sensitive to the finish of the surface. This is where people were having random breakages with titanium and they were calling it brittle or saying it didn't have the strength of steel. But this was a processing problem, not a problem with the actual material. Without getting too deep in the chemical engineering, how does titanium stack up to steel and aluminum, in both strength and weight? In the order of how the different materials add up to each other, basically the rule of thumb to go by is, anything made from steel can generally be replaced with titanium. The reason is, the strength level of titanium is equal to your better grades of chromoly steel. One of the fallacies out there is people say titanium is stronger than steel. Well, it's not. It's equal to your normal heat treated steels. Once you get into the exotic steels, they can be quite a bit stronger than titanium, but you have more weight. Basically, titanium is 47 percent lighter than steel with the same size and shape part. In most locations on the motorcycle where a fastener is made from steel, we can reverse engineer it into titanium in the same dimensions. Another way to look at it is steel fasteners on a motorcycle have class number, a metric specification of 8.8. That is equivalent to, let's say a non-treated titanium fastener. Some of the internal engine parts have 10.9 strength fasteners, then you have to get into using titanium fasteners that are heat treated meet the same specification of heat and strength. Technical numbers on it would be, the 8.8 specification generally has a strength of 120,000 psi strength range. Your heat treated fasteners are up at the 150,000-180,000 psi strength range depending on where the part is on the motorcycle. This tells you, based on location of the bolt, if can you get away with non heat treated titanium or do you have to step it up and go with heat treated. Where does aluminum fall into this? If steel and titanium are both equal in strength, then aluminum is half the strength. When you get into the 7000 series of aluminum they get to about two thirds the strength of titanium. The problem is that the ductility of aluminum is less than steel. This is what comes into play when designing parts, especially the axles and some bolts, like cylinder head bolts, the stretchiness becomes an issue with titanium. And the technical term for that is modulus of elasticity. That's why a when looking at a titanium spring, it has less coils in it. With the modulus number of titanium being half of steel it's going to flex twice as much for the same amount of load. So let's give an example. Let's say it's a steel bolt and you give it 1,000 pounds of force on the bolt, the bolt is going to stretch a certain amount. A titanium bolt with that same 1000 pounds of force is going to stretch twice as much. Because of stretching it will still carry the load as long as you are within the elastic limit. That's why people say they have a problem with the bolt stretching, but they both stretch until they come up to the clamp load that holds the assembly together. In motorcycle terms we see this in the triple clamps. There have only been a few riders we know that have the ability to tell the difference between steel bolts and titanium bolts. That same rider can tell the difference between 15 foot-pounds and 18 foot-pounds of torque. There are only a few riders that are that sensitive to tell the tiny differences in the triple clamps. Across the board right now we pretty much have everybody running titanium triple clamp bolts and titanium front axle pinch bolts. You mentioned that the proper manufacturing process of titanium is something called hot forging. Can you explain that? So the grain of the metal actually flows and ideally we want the material to flow almost like a mushroom head and you want the grain to turn the corner into the head. This makes the grain structure a little bit finer, and finer grains are stronger and have more fatigue resistance. And same thing with the threads, the thread grain flow when we section the bolt, you can actually see the grain going around each peak and valley of the threads. That's how to properly check if you have any problems with your machining process. You check randomly to make sure the grain flow looks proper in the threads and the head. How do you guys get the raw material? Are you getting a huge roll or chunk or brick? The titanium comes in three meter bars in whatever diameter the bot is. We have a certain specification that we spec to our material provider. From that point we cut the blanks and then from there, we send them to the hot forging process. There are titanium framed bicycles, and obviously the forces in cycling and motocross are completely different, but would it be wise to build a titanium framed motocross bike? Is it only cost that is preventing that? If you look at the modulus elasticity, titanium frames are going to flex more than a steel frame. A steel frame will be in the middle, and an aluminum frame would be the most stiff. A titanium frame will have a lot more give and flex like a big rubber band. Somebody could reverse engineer and build a titanium frame but with the flex characteristics, you are going to be in a whole new testing range. You'd have to redo everything to make the bike respond the way the rider wants. Is that a reason that you don't see titanium swing arms or things like that? I believe that comes down to fabrication costs and I think the flex is a big issue of it. In a swing arm, you'll end up having three times the flex than an aluminum swing arm. I know people do try different aluminum swing arms for different results in flex. We have tried, for instance, changing the swing arm pivot in titanium to steel, we've tried titanium pivots that are solid, we've tried titanium pivots that where tubular, and we've also done the same thing in steel. We did all that testing with factory riders, and believe it or not, some of the factory level riders can feel a difference between solid titanium, tubular titanium, and then back to stock steel. What people might not realize is that a tubular swing arm pivot has more flex resistance than a solid swingarm pivot bolt. Solid titanium will flex more. We've used all this to make different parts for different teams, based on what they want. Obviously factory teams have a bigger budget than your average rider. Where should the average rider start when thinking about buying titanium for their bike? We always say the best place to start is the unsprung weight. So in motorcycles that's the axles, the rotating weight of the disk and sprocket bolts, the hardware on the rear swingarm, all the hardware on the front end, front caliper bolts, we even have the caliper pins... So those would be the areas to go after first. The second part to go after for the budget minded racer would be motor mounts and all of the bigger hardware on the bike. The final phase would be to do all the other fasteners on the motorcycle. We even do some of the internal hardware in the engine in titanium. A vast majority of the parts that we make for the supercross and motocross teams are available to the public and you can buy it one piece at time, you don't have to buy a whole kit. Are titanium shock springs a good idea? There have been several manufacturers out there that have got into that. The problem is, titanium is very process control sensitive, meaning, how do you get consistency in the springs? That is consistency in the spring rate as well as consistency in not having a defect and causing a failure. And that's been the trick, or the problem with titanium springs. But, it is a great way to save weight. You have to change the valving because the spring has a bit of a different curve. Just my understanding from talking to people, the consistency of the springs and the reliability of the springs isn't quite there, though. What about titanium gas tanks? Honda is currently using them on all its CRF models. From a cost perspective in OEM production, yes, it's a good way to go because you can get a repetitive good part. I mean, the ultimate would be carbon fiber tanks, that you see occasionally, but the cost difference makes it, for the average person, out of their budget. The titanium tank is a good way to save weight and some thermal characteristics of titanium, like it doesn't like to transfer heat as much. 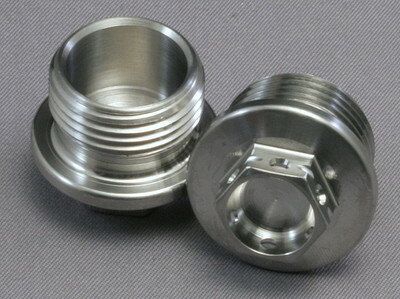 A couple questions from our forum about titanium... What about titanium pistons? I've heard of people doing that, but the thermal expansion of titanium is different than aluminum. Right now, the aluminum pistons and aluminum cylinders have been developed to maintain the proper clearances. As far as weight savings, you're going to have about twice the the strength of aluminum so you could reduce the amount of material in the piston to save weight. But from a manufacturing standpoint, it doesn't really make sense. There are some aluminums out there that have really good thermal expansion control so they can have tighter clearances. So, I don't think a Ti piston is an affordable thing for someone to put into a manufacturing process and make money at, I just don't see it happening. And just so we are clear, with the same size and shape bolt, titanium would be stronger than aluminum, but aluminum would be lighter, correct? How about lifespan? No one really worries about stock steel bolts wearing out but is this something that you would have to be concerned about with titanium? No. With the right fastener at the right spec per your owners manual, you're looking at the fastener being used for multiple seasons of riding. We have privateers that run the same fasteners on their bikes for two or three seasons. Most of the factory teams will take the titanium from the factory bikes and put it on their practice bikes the next year. The only exception that we see with riders at the supercross, motocross national level is linkage bolts. There has been a history with the linkage bolts being fatigued at the head, or the thread side will have a fatigue crack because the way the bolts ride in the suspension. On the bikes that have 12mm linkage bolts, which is Honda, Kawasaki, and Suzuki, even steel bolts are being bent. Titanium is not really suitable for that location. Yamaha has oversize linkage bolts, they work great, and KTM is in the middle with 14mm linkage bolts. That is walking a fine line if titanium can be used there. Every other fastener on the motorcycle you can run multiple seasons, totally safe, with no problems with fatigue or with anything where you can't get the fastener on or off. The front axles seem to have an infinite life, we don't see any problems there ever. The swing arm pivot, because of the side to side action, you will see some wear after about two seasons. With the rear axle at the end of a season on the chain side, because of the whipping action of the chain, you'll see indentations where the bearings are wearing into the rear axle. Again, at the supercross level, we are looking at about 55 hours of ride time on the rear axle. A normal rider that is racing on the weekends, will get multiple seasons out of the axle. And it isn't a failure were it breaks completely and the wheel falls off. Basically, you'll start to see a crack form under the head and we've made many different changes to the axles over the years to help them from not getting fatigue cracks. Is there any treatments or products that you should put on titanium bolts before using them? When it comes time for assembly, we recommend to use anti-seize of some type. It can be an aluminum or copper anti-seize, but better than that, we like to use moly assembly paste. So the same moly paste that you'd put on your cam lobes. Look for one with a 40 percent moly content. The molybdenum gets ground into the surface and prevents any galling between the titanium and aluminum, or ti on ti nut. With axles, a thin layer of grease is recommended so the bearing isn't beating on the dry axle. Then, when you're doing your normal maintenance pull them out and drop them in 409 or Simple Green to soak them overnight or if you have an ultrasonic cleaner they'll come out super bright and clean again. In some places you need to use Loctite like on rear sprockets, you can use blue Loctite on it and it actually also keeps the bolts from galling. What about the future of titanium? Is there anything that you guys are working on or working with teams with that we currently don't have titanium uses for but you know are coming down the pike? A trend that we've been trying to do is make bolts more mechanic friendly. For instance on the number plates and shrouds, instead of having the bolt and the individual collar that goes into the plastic piece, we've been designing bolts so that the fastener is one piece where the bolt and the shoulder and washer are built into one part. So when you're doing your maintenance it's easier not to lose those pieces. Also trying to make all of the heads of the fasteners all the same wrench size. 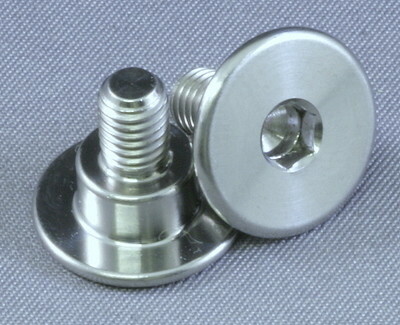 Typically for all the smaller fasteners it is an 8mm hex bolt, and the larger ones are 10mm. That way a mechanic can use one or two wrenches to take the whole bike apart. 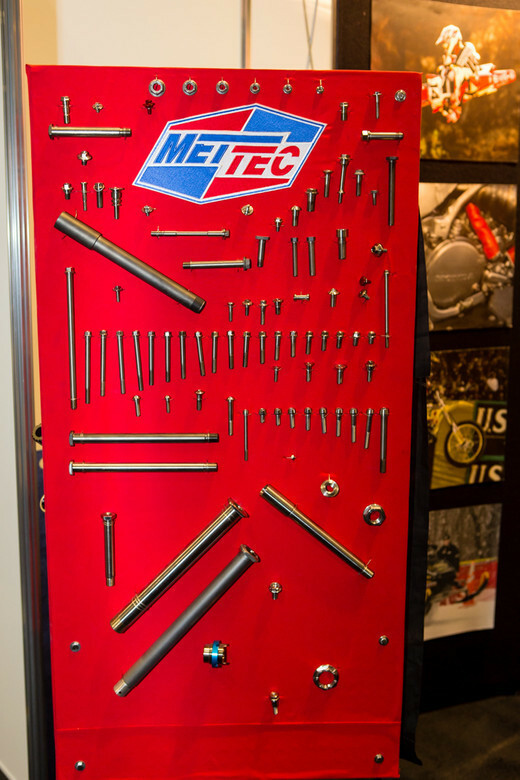 For more information about getting your bike lighter one bolt at a time, check out Mettec.com. when Chad Reed was a private Honda Rider in 2011 (i think) Just before Factory Honda picked him up. . He was selling hes CRF450r , I remember seeing the add. It said it had a full Titanium frame. After he was given a factory Honda he was asked , whats the biggest difference between your private honda and the factory Honda ( he said weight was the only difference). Magnesium has been used in Formula 1 for years. Are the factory teams using Magnesium frames and parts yet. "What people might not realize is that a tubular swing arm pivot has more flex resistance than a solid swingarm pivot bolt." A solid pivot bolt will be stiffer than a tubular one so long as they're the same material. Maybe he means specific stiffness? The hollow bolt is a lot lighter than the solid one and only a little less stiff since the material in the middle doesn't add a lot of stiffness relative to the material on the outsides. Interesting article, love learning about the science behind TI and other metals. What about torquing when using a anti seize? I don't agree with using anti-seeze or grease on threads if it's not specified by the OEM. Lubricating the threads decreases clamp load with the applied torque remaining constant. You have that backwards. Lubricating the threads will increase clamping load if the torque is constant. Dry torque is always higher than lubricated torque for that reason. This is correct, a lubricated bolt will provide a higher clamping force per a given torque than a dry bolt will. That said, if a torque spec that is intended to be used with a dry bolt is used with a lubricated bolt, it can lead to a bolt tightened past its yield point (ie it's junk). This is something that really should be specified in the service manual but almost always isn't. Consider though that a loose bolt will fail in fatigue much more quickly than a tight bolt will, so you're better off being on the tighter side than the loose side barring yielding.